Jazz ain't dead; it's just evolving! Hammond B3 organ fans know Joey DeFrancesco; he has played that beast for years. His father, “Papa” John DeFrancesco, was a fine jazz organist in his own right; at the age of 5, little Joey was playing Jimmy Smith songs note for note. Joey would sit in during his father’s gigs until he was 10; he then began to play with other great bands in Philadelphia headed by artists such as Hank Mobley and “Philly” Joe Jones. Joey released his first album when he was only 17. You name the artist or group; DeFrancesco probably has played with them. Miles Davis was perhaps the most famous; he asked DeFrancesco to tour with him when the organist was just 17. During that period, DeFrancesco also began to play the trumpet, which he still does today. 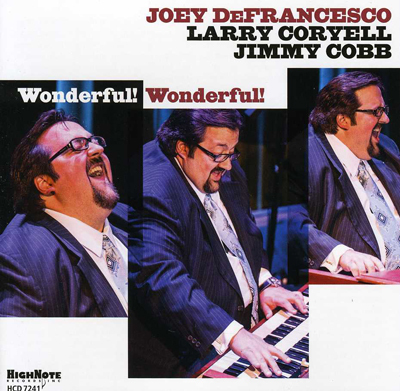 Two of DeFrancesco’s albums have been nominated for Grammy Awards, and he was named Downbeat’s Organ Player of the Year five times running. DeFrancesco is a “burner”: He loves to play, and he shows it. He particularly enjoys up-tempo meters, and he’s all over the keyboard at any tempo. This release presents him with his trio — his favorite setting — and he’s joined by guitarist Larry Coryell and drummer Jimmy Cobb. You’ll immediately notice that DeFrancesco’s foot-pedal technique, blended with Coryell’s guitar, combines so nicely that you’ll swear a bassist is playing with the group. DeFrancesco composed one of these eight tracks — “JLJ Blues” — and the rest are by other artists. The most interesting is a version of that famous old Western song, “Wagon Wheels.” Now, that’s a tune I’ve never heard in a jazz mode, and it comes out swinging! Let’s face it, DeFrancesco is a lot of fun! If you’re lucky, you’ll live to experience a “Once in a Lifetime” event. Pianist/composer Fred Hersch’s trio is just such an event, and this album is the proof. 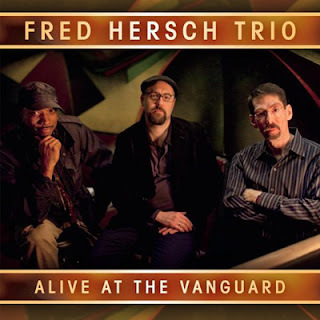 Since moving to New York City in 1977 at the age of 21, Hersch has been a significant presence in the jazz scene. He released his first record of original compositions in ’91, and since then has made almost 50 albums as a performer, soloist or leader of groups of various sizes. Hersch went public with his AIDS diagnosis in the early 1990s and has lived, and survived, a life that’s difficult to imagine. He has endured periods, on and off, when he was not expected to survive his illness; somehow, he fought through them. The worst such time occurred in 2008, when he developed AIDS-related dementia, fell into a coma that lasted for two months and, after awakening, lost nearly all motor control in his hands. After months of rehabilitation and therapy — and a refusal to accept his problems as anything but “temporary distractions” — he recovered fully. Since then, aware of the potential shortness of his life, he has worked incessantly and produced his best music. His peers, and those who know him, are well aware of his expertise. Hersch was the first solo pianist booked into the Village Vanguard, and has made numerous return appearances with his groups, most often the trio format. This double-CD is the most recent recorded “Alive” at this famous venue. The first disc contains eight tunes; four originals by Hersch and standards by Charlie Parker, Ornette Coleman, Romberg/Hammerstein and Sonny Rollins (Doxy). Disc 2 follows up with three more Hersch compositions and standards by Styne/Cahn, Russ Freeman, Kern/Hammerstein and Thelonious Monk. “What” is played, however, isn’t as important as the “how.” Each tune is masterful; I’ve never heard them done better. Although Hersch is the principal driving force, his trio companions — bassist John Hebert and drummer Eric McPherson — have much to do with the excellence of this music. They provide support without ever getting in Hersch’s way. I’m aware that the phrase “they think as one” is overused by reviewers, but I simply can’t think of a better way to describe the excellence of the interaction here. Pick any track at random, and you’ll see what I mean. “Opener,” which kicks off Disc 2, is a prime example: An up-tempo series of chords and runs by Hersch establishes the beat, then Hebert overlays notes and chords that augment what the piano has initiated. A series of very tasty drum passages follows, and then the piano rejoins the group ... and the trio has been introduced to the audience. I’ve never enjoyed a performance more, and you have two additional hours of such pleasure on this release! 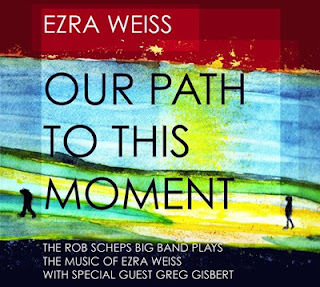 I first encountered Ezra Weiss in 2009, while reviewing Alice in Wonderland: A Jazz Musical, the first of two works he wrote to expose young children to jazz; it was named one of the Top 10 cast albums that year by TalkinBroadway.com. In 2010, Weiss followed up with Don’t Let the Pigeon Drive the Bus. Weiss holds a bachelor’s degree in jazz composition from the Oberlin Conservatory of Music, a master’s degree in jazz piano performance from Queens College, and has won the ASCAP Young Jazz Composer Award three times. He has arranged and composed for numerous name groups and currently teaches at Portland State University. Rob Scheps, who plays all of the reed instruments, is a New York native. He attended both the Manhattan and Eastman Schools of Music, formed and worked with numerous groups in and around the Big apple, then moved to Portland, Oregon in 1997. He’s a member of that city’s symphony and also is on the faculty at Portland State University. Scheps’ standard big band consists of five reeds (he handles tenor sax), four trumpets, three trombones, a tuba, piano (Weiss), bass, drums and an additional percussionist. For this album, Scheps also added trumpeter Greg Gisbert, who has worked in bands fronted by Buddy Rich, Woody Herman and John Fedchock. This album features seven compositions and arrangements by Weiss: truly serious jazz. You’ll hear chord structures and rhythmic variations that are much more complex — and interesting — than those used by standard big bands. The solo passages aren’t “written,” but their chord progressions are; they therefore “fit” wonderfully into the basic ensemble background. The result doesn’t swing in the same way that Woody’s Herds did (as one example), but what comes out definitely qualifies as jazz. Repeated playing will reveal nuances that you may have missed during earlier visits, which then demands yet another repeat play. You can listen to this orchestra for hours ... and you’ll still want more. Don’t miss it! Step into your time machine, fasten your seat belts, and settle back for a visit to the Duke Ellington era. Have you ever wondered what it would be like, if a modern musician were to wander onto the stage and sit in with one of the great bands of the past? Well, that’s what this album is all about. 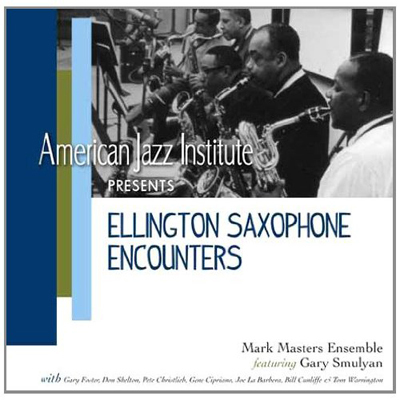 It’s a collection of tunes written by members of Duke’s bands, during the era when he reigned supreme, and played here by eight of today’s top artists: the Mark Masters Ensemble. This group’s instrumentation is unique: five reeds and a rhythm section consisting of piano, bass and drums. Each individual is famed, having spent a career working with top-level jazz groups. The baritone sax is held by the award-winning Gary Smulyan; the other reed players — each fluent with clarinet, alto, tenor and flute — are Gary Foster, Pete Christlieb, Gene Cipriano and Don Shelton. The supporting rhythm section features pianist Bill Cunliffe, bassist Tom Warrington and drummer Joe LaBarbera. Leader Mark Masters is responsible for the arrangements. The Ellington artists who contributed the tunes — all part of Duke’s library over the years — include Johnny Hodges, Paul Gonsalves, Harry Carney, Jimmy Hamilton and Ben Webster. All are Jazz Hall of Fame members. You’ll swear it’s Duke’s wonderful band from the first bar of the lead track, “Esquire Swank.” Close your eyes, and you’ve time- and place-shifted back to one of the great 1940s ballrooms. The same can be said of all these tracks: This is, indeed, an encounter of a most magical kind. It’s an ensemble and album to die for. If one were to cite the instruments least likely to be utilized in jazz, the harp would be near the top. 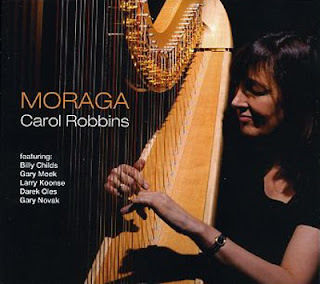 Well, fasten your seat belts: Carol Robbins is a harpist, composer and arranger, and Moraga, her newest album to date, is proof that this ethereal “horn‚” is, in her hands, fully capable of producing beautiful, swinging music. As a child, Robbins began as a pianist; she switched to the harp at age 10. She may not be well known to the general public, but her expertise has made her a staple among individuals famous in their own worlds: She has performed for presidents and celebrities, been featured in films and on television, and has been nominated for Grammy Awards. She maintains a busy concert schedule and is highly regarded in the music world; she has no problem acquiring top level musicians with whom to perform. That’s the case with this release. The quintet supporting her features Billy Childs (piano), Gary Meek (sax and clarinet), Larry Koonse (guitar), Darek Oles (bass) and Gary Novak (drums). Regular readers know that I consider Koonse and Oles to be among the top artists in the jazz world, and Robbins’ association with Childs goes back years. Robbins composed six of these nine tunes. Childs contributed “Hope in the Face of Despair,” while “Caminhos Cruzados” comes from Antonia Carlos Jobim. Cole Porter’s “Every Time We Say Goodbye” is the lone standard. All but one of these tunes are done at balladic tempos, some with a subtle Latin feel; the exception is “Straight Away,” a burner that gives each performer a chance to stretch out with some dazzling solo work. This album is gorgeous in every respect. That descriptor isn’t often used when referencing jazz, but it’s apt for this release and these artists.